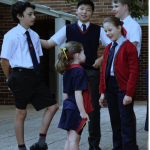 Radio Interview Transcript (11 February 2019): Richard Glover on Drive talking to Co-Founder of Girls’ Uniform Agenda, Dr Amanda Mergler and Principal Phillip Heath, Barker College, Victoria. Richard Glover: After a change to uniform policy last year, NSW public schools are now required to offer shorts and trouser options to girls. There’s no longer a need for the girls to wear a dress if they don’t want to. But the edict doesn’t cover private schools. And there’s been debate amongst private schools about whether to go the way of the public schools and let girls have the choice or to stick with the tradition of the school, I suppose, and have dresses only for the female students. Richard Glover: How many private schools are still reluctant? Amanda Mergler: We have a very large number of private schools who are still reluctant, unfortunately. So, we’re up in 90% of schools that are refusing to allow girls shorts and pants to school. Richard Glover: Really? So the majority are still saying no? Amanda Mergler: Absolutely, they are and we’re sort of dumbfounded as to why that would be. Often those schools talk about their desire to empower young women and then they refuse to let them choose between shorts and pants and a skirt and dress each day. Richard Glover: Why is it important for you? Amanda Mergler: Well, it’s important for me, initially for a personal reason, my own daughter wanted to wear shorts to school and she was originally forced into a dress from grade 1 at a public school. But, it’s important for all girls, because one of things we have is very clear research that girls do a lot more exercise when they’re in shorts and pants than when they’re wearing skirts and dresses. We also hear from girls constantly now that we’re Girls’ Uniform Agenda. We had one that just came in yesterday and she was saying, I don’t feel comfortable in dresses, my dress flies up, we bought the boys’ shorts and wore them to school and we got taken out of our classes and I had my prefect badge stolen from me. We’re constantly hearing from girls who want this choice and why would we not allow that? Richard Glover: Some schools say, look, it’s their tradition and they also point out that girls wear shorts for sport. They’ve usually got a sport uniform that feature shorts. Amanda Mergler: Yes, definitely. And what we find is that girls want to be active most days. So, lots of kids play sport in their lunchtime, they want to run around and kick the ball. And girls really can’t do that in a skirt or dress, they’re very conscious about flashing their underpants. We also have a number of traditions like women having to give up their jobs when they married, that we’ve moved away from, because we appreciate that it’s discriminatory to treat the genders differently in those ways. And just as boys can move freely everyday, girls should be allowed to as well. Richard Glover: Ok, but still, lots of private schools in NSW disagreeing with that. Amanda Mergler is here from Girls’ Uniform Agenda. One school that has decided to shift is Barker College, Phillip Heath is the Head. Good Afternoon Phillip! Richard Glover: Why did you decide to do this? Phillip Heath: Well, it just made sense. It’s 2019 for goodness sake, you know. It’s giving people choice and not allowing gender to dictate everything, just seems to me to make perfect sense. It’s been a long journey though, 3 or 4 years of consultation and conversation and it was much more controversial than I imagined it would be. Richard Glover: Ok, what was the negative response. What did people say who didn’t want change? Phillip Heath: It’s the tension between tradition and progression. With tradition being this is the kind of thing, part of belonging to this community means wearing a particular garment in a particular way. Versus a more progressive view which is the one we’ve just heard articulated so well: that is to say to allow choice, allow people to do more things, allow the uniform to be more comfortable and versatile and we opted for the latter. Richard Glover: Yeah, because obviously you’re not saying no to dresses. If a girl wants to wear a dress she wears a dress. Phillip Heath: No, not at all. Choice is the big thing. One of things that we tried to explore in this was ways in which boys and girls can feel comfortable, positive about themselves and actually more positive about each other. So, the girls can be proud of the boys, the boys proud of the girls in the way that they present to the world. And that helps us to belong and to connect. So, today, for instance, we’ve got Cadets happening here. And girls are wandering in their cadet uniforms, they’re not in skirts. And this has been happening for years. So, it’s just odd that we’ve made this such a sacred issue in the life of schools. I accept that some traditions need to be defended. I’m not persuaded that necessarily a skirt is one of those issues. Richard Glover: And, again the reason for you is about exercise, they want to be free to move around without feeling their knees are constricted or they’ll show off their undies, or whatever it is. Phillip Heath: Exactly, and at any age too. We know that the participation of girls in exercise after a certain age declines, the research is all very clear about that. But, it’s not because they’re idle, or so uncomfortable about their appearance, it’s more to do with how the social construct works. The telling thing was a visit I made to an interstate school early last year, or it might have been late the year before, and talked to some Year 9 students. I asked some of these students, boys and girls in this group, tell me what you like to do at lunchtimes. One of the girls said she loves to play chasings. But, I said “Ah, really, where do you do that?” well she said, “I don’t do that anymore, because I can’t in this skirt, who could?” And the staff who were the host, had never heard this expressed. So, in other words, in over two decades, no-one had asked the kids what they thought. Richard Glover: And the ways in which that clothing was restricting them. Phillip Heath: Exactly right. No-one had ever said would you play chasing if you could? But, now you have to go and change into your sports kit and that’s when you do your official sports. But play and being, is all part of a natural human experience and we should just make that possible within ways in which we can to respect uniform. Richard Glover: Just tell me, finally, in the upshot, how many girls have chosen the shorts against how many girls are choosing the dresses, or do they mix and match each day differently? Phillip Heath: The last one, they mix and match. It depends on day, temperature, time, who they are, how they’re feeling. That’s been really interesting to watch actually. But, I have noticed, that access to shorts and trousers is increasing. Richard Glover: And has it increased the amount of play? The physical play? Phillip Heath: Oh yeah, no doubt about it. No question about that. The tumbling play that could be indelicate, or uncomfortable, is now a norm. And that’s the way you would want it actually. Richard Glover: Isn’t it funny, we’ve had National Commissions and books and research project, “How do we combat obesity?” Give them a pair of shorts! Phillip Heath: Well it helps. It hasn’t helped me though!